Better access to rehabilitation and quicker treatment are the key to beating the massive sickness, illness and incapacity problems that are still holding back the British economy and adding to skills shortages, experts suggest. However, despite the negative impact of related-problems such as sickness absence employers are still failing to address the issue of employee wellbeing and health with sufficient vigour. 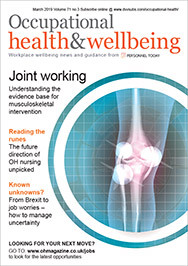 Figures highlighted at a recent EEF Northern conference show that only one in eight UK employees have access to occupational health services, despite the huge toll that musculoskeletal problems exact on the workforce. The Department for Work and Pensions Lords minister Lord Hunt told delegates at a “Fit for Life, Fit for Work, Fit for the Future” event that employers and government needed to work together to combat the problem of sickness. “We need to help get people back to work if business in the UK is to prosper. Too many people are stuck in the cycle of incapacity benefits support and too many people leave work early because of ill health. “Sickness and ill health harm both individuals and businesses because they have an impact on the bottom line,” he said. The official figures will make worrying reading for employers, with more than 200 million working days lost to sickness absence in the UK every year, at the cost of an estimated £12bn to the economy. Hunt warned that current levels of ill heath would be unsustainable in the future, with falling demographics and an ageing workforce draining resources even further. “We need to create workplaces where health and safety and employee wellbeing are protected and where staff have access to competent occupational health support. There needs to be a real emphasis on getting people back to work through treatment and rehabilitation,” he said. He admitted that most people currently wait far too long for occupational treatment on the NHS, but hopes that employers will realize that investing in private treatment can often lead to savings because staff will be back to work more quickly. He cited the example of British Polythene Industries, where a private rehabilitation scheme reduced long-term sickness absence from 26 days to 4 days per employee per year, saving the company £12 per every £1 invested in the programme. “If employers really take this seriously there’s no doubt that it can provide huge benefits to the bottom line,” he added. Employers were also urged to take action at a much earlier stage by Dr Sayeed Khan a commissioner with the Health and Safety Commission, who said the window for successful rehabilitation was probably between four and six weeks. “Rehabilitation helps to improve recovery times and reduce the overall costs. Sicknotes for work-related stress need to be tackled on day one, to find out exactly what it is that is preventing an individual from working,” he explained. Khan believes that stress has now entered the modern vocabulary and is often used to describe a range of problems that are not really work-related nor debilitating. However, the overall fitness levels of modern society (especially among younger people) will be a real concern for employers in the future, as they battle with increased rates of diabetes, heart disease and chronic illness. “Stress will die down eventually in the same way RSI did. It is obesity that will be the next huge issue. The people coming through now will be the first generation with lower life expectancies than generations before them. “The workforce is going to suffer huge problems with obesity and a lack of exercise,” he added. Sport England has been helping employers to drive up levels of fitness and wellbeing through initiatives like the Everyday Sport campaign. Regional director Judith Rasmussen said the programme helped to reduce levels of employee inactivity by 5% during a four-month trial. As part of the scheme employers such as Asda organised activities including five-a-side football tournaments, office games and “ban the lift” days to get staff moving. The health message could soon be a huge driver for employees as the workforce gets older and less active and it is clear that a united approach involving both government and business will be needed to get the UK up and running again.